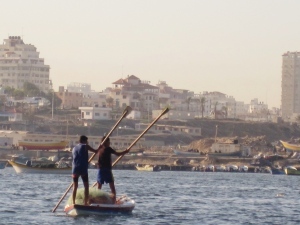 Here in Gaza, people — especially the youth — are really excited about the new flotilla on its way from Turkey. 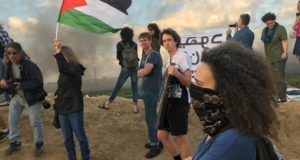 “I can’t wait to receive my brothers and sisters who share our suffering and who also experience Israel’s apartheid policies and aggression,” said 19-year-old Al-Azher University student Hussien Amody, upon hearing news that a Palestinian from Haifa was on board yesterday evening. Hussein subsequently stayed up all night making signs and posters for today’s march in Gaza demanding that the United the Nations and the international community protect the two small boats. “Two boats are coming from Turkey to Gaza right now,” I said, as our small white boat left port. “Inshallah,” Godwilling, he said, and then asked where the boats were from and other details. A tiny boat rowed by two young men balancing delicately on the edges passed by as the Mediterranean undulated below them. Salah shouted to them the news and they exchanged a brief conversation. “I think the Israeli navy will stop them,” he said as continued out to sea. Indeed, that’s what the IDF spokesperson had declared on Twitter the night before. Nonetheless, Salah yelled out to a passing yellow and blue trawler the news. 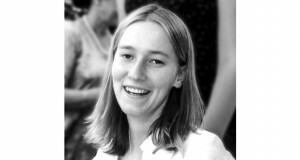 The trawler had eyes with long lashes and a smiley face painted on its wooden bow. 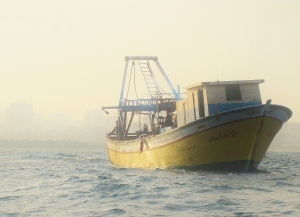 Palestinians on a similar trawler reported being shot at by the Israeli navy when I was out at sea yesterday. We had heard the automatic gunfire as we were leaving port. The Israelis have an elite navy and all the Palestinians have are their pink, blue and yellow smiley faced boats, I thought. I shared with Salah that the boat was bringing Palestinians from outside Gaza, since that was something the youth here were particularly excited about. A few them had mentioned that because of Israel’s complete closure of Gaza, they hadn’t been able to see their family members in the West Bank or leave Gaza for university in the West Bank or abroad. something that, in his mind, Israel would clearly prevent from happening. I tried to convince him that maybe this flotilla would be different. “[Prime Minister] Erdogan has promised that the Turkish navy will accompany freedom boats to Gaza,” I said. “And the boats left from Turkey,” I added, attempting to convince Salah, and even myself. Indeed the Canadian boat tweeted last night that they believed the Turkish Coast Guard was behind them. 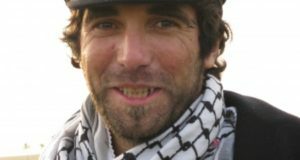 Despite Israel’s declarations that it will stop the flotilla, Palestinian civil society groups and even the fisherman have a big welcome in store for Freedom Waves. Why is Israel trying so hard to keep 27 civilians from seeing what life is really like behind the blockade? What is Israel trying to hide? Check out this solidarity song with Gaza and keep the #FreedomWaves rolling on Twitter.